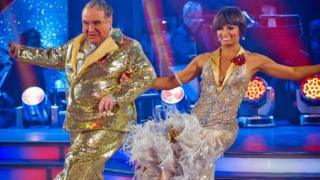 Astrologer Russell Grant is enjoying his reborn fame on Strictly Come Dancing, but is already planning his next step off the dance floor. Grant, who has been delighting Strictly fans with his flamboyant routines, says it has opened the "floodgates" of offers and opportunities. But closest to his heart and home is a proposed showbiz academy at Coleg Harlech, Gwynedd. He says it would give people of all ages a grounding in performing arts. Grant, 60, originally found fame as an astrologer on TV and radio in 1984, but after a period out of the spotlight he has emerged a star of the BBC Saturday night dance contest. He said: "Basically, Strictly has allowed me to return to showbiz where I first began and I'm happy to be involved with the academy of showbusiness in Harlech." Plans for the academy are in the early stages, but the intention is that it would cater for people of all ages. "It's a great fallacy that theatre workshops are for young people as everyone, whatever their age, should reach their creative capacity," he said. There is a meeting next week to discuss the curriculum, but Grant said the course would be something "which has never been done anywhere else - we don't want to cut across anything which is already being offered". It will offer musical theatre, drama and "quite a bit of broadcasting". A spokesperson for Coleg Harlech said it is "fully supportive of the plan for the academy, as it's something we'd like to do, subject to funding". So far his outlandish performances - including a paso doble which started with him riding a pretend bull - have kept him out of the Sunday night elimination. Next Saturday he and the other Strictly stars will perform to a 6,000-strong audience at Wembley, and he is thrilled. "I didn't expect to get this far. When I began my goals were to get to Halloween and to Wembley," he said. "It's a massive occasion and for me it's my final where I'd never believed, never imagined I'd get to... it will be the biggest entrance I've made. It will fit the occasion," he said. Grant is one of three Strictly celebrities - with presenter Alex Jones and footballer Robbie Savage - flying the Welsh flag, and he has even thanked the public for their votes in Welsh. Grant has lived in south Wales, but now says he will now never leave "gogledd" - or north Wales. "I first moved to Caerdydd [Cardiff] in 69 and I've lived in Barry for 20 years as well as Y Fenni [Abergavenny]. "My mother is Welsh and my 'hen nain' [great grandmother] came from Parc near Bala." Scenes from his Strictly training sessions have been filmed around his home at Maentwrog in Gwynedd. "We film all over the area and cymuned [community] means so much to me." Health problems, notably his knee, have made the headlines and despite being offered an operation in Harley Street, a decision has been made to defer the operation until the new year when he "gets home". He said the fact he could still dance was thanks to the expertise at Ysbyty Gwynedd hospital in Bangor and he would rather have his operation there than anywhere else. Grant paid tribute to his "wonderful" professional dance partner Flavia Cacace, and said he was "overwhelmed and humbled" by his supporters. He will not be drawn on who - if not him - will eventually lift the Strictly glitter ball. "I have no idea - they are all my friends, all of them are worthy winners." Has The X Factor lost its shine?